Some time ago we looked at a Permian Paleobotanical Pompeii found during mining operations in China. A just published paper announces the discovery of another fantastic window on the past uncovered by strip mining, this time in Spain. This publication documents the work done primarily by Luis Alcala and his colleagues from the Museo Aragonés de Paleontología in Spain. While Europe has a long history of dinosaur discoveries, including the first dinosaurs ever illustrated, described, and named in scientific literature, the continent lacks the spectacular bone quarries, such as Dinosaur National monument, that are seen in western North America. Limbs, vertebrae, and other bones of a plant eating dinosaur from the strip mine floor. The Spanish site contains a remarkably diverse array of fossils, including several kinds of dinosaurs, crocodiles, turtles, boney and cartilaginous fish, invertebrates (including bacteria!) and plants and pollen. 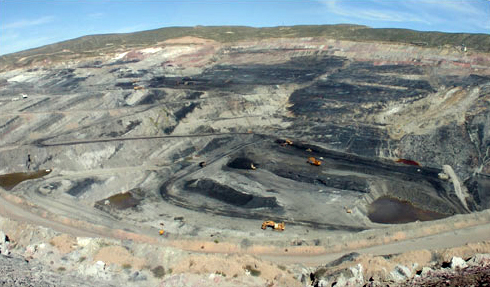 The lignite coal mine northeast of Teruel is managed by a family run company Sociedad Anonima Minera Catalano-Aragonesa, which has been running excavations in the area since 1919. The fossil producing level is fortuitously situated immediately below the lowest level where the coal is extracted. This means that when the mining is finished at a particular area the exposed rock on the mine floor is the fossil producing bed. 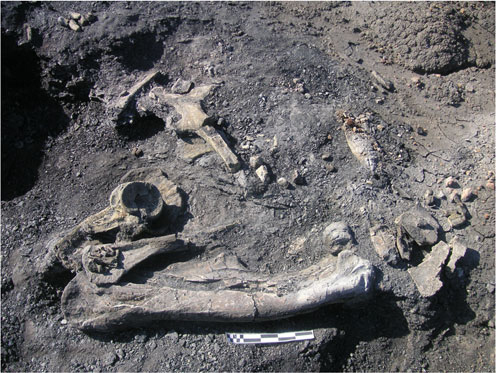 The fossils are Albian (Lower Cretaceous) in age and this is the most important Albian dinosaur site yet known from the continent. The fossils were deposited in marshes that were part of a system of lagoons and barrier islands, similar to those along the coastline of present day North Carolina. 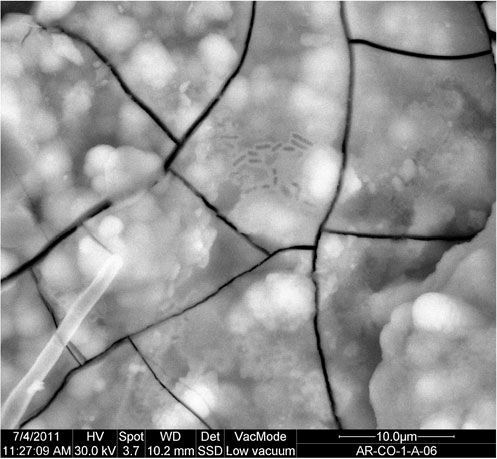 Scanning electron microscopy image of a strip mine coprolite. Rod-shaped objects are fossilized bacteria. Some 150,000 m2 of the bone deposit have been already been prospected and since it is newly exposed, there is no covering or vegetation to hide the fossils. Without the mining these fossils would remain buried hundreds of meters below ground, completely unknown to paleontologists. The Albian dinosaur bone mine in Spain. Fossils occur in the floor of the mine. Note large orange colored mining machinery for scale. However, paleontological work in an active mine is fraught with danger and scientists must work around the mine operations. Some of the fossils collected are in extreme danger from mine activities and their collection is rushed. In other areas a more standard paleontological excavation and mapping program can be followed. Because this is a strip mine, with a road spiraling down into the mine, the contours of the mine are being changed by earth moving machinery all the time of time, , water pipes are installed and moved, roads are relocated, immense trucks are driving across the area, erosion occurs, etc.. Safety of both company and scientific staff is of paramount importance. The skull of a strip mine goniopholid crocodilian, seen from above and with snout towards right. Nevertheless the rewards are great, with over 4,000 bones having been collected by the end of 2011. And as the mining proceeds more of the fossil layer will be exposed and more fossils discovered. The paper appearing today is a preliminary description of the site, its geology, and the fossils. Numerous other, more detailed papers, are currently being written as we speak. I, for one, am looking forward to reading them. All photos from Alcala et al. 2012 (see SOURCES below).